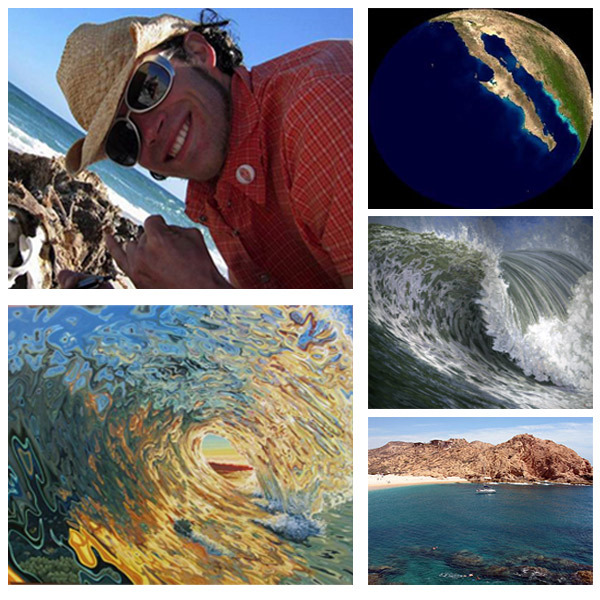 Join CHILI THOM for 8 days of adventure, culture and education in PESCADERO, BAJA, MEXICO. Chili will lead the group to understanding the process of painting water. We will look at the patterns and color groupings commonly seen in water and go through a series of exercises designed to help you understand and capture motion, reflection and colors commonly seen on waters reflective surface. With several days on the water surfing you will hopefully be able to see and comprehend common color groupings and the almost mathematical patterning of water. In addition to workshop –there are surfing lessons at Los Cerritos Beach, a boat cruise to Santa Maria Beach for snorkeling and a night at Los Milagros Hotel in Cabo San Lucas, access to yoga classes, massages and day trips to Todos Santos with tours of art galleries are available. – RT ground transportation from San Jose Del Cabo to El Pescadero Beach House and thruout the Southern Baja. – 8 night’s (based on double occupancy) with 1 night in Cabo San Lucas at Los Milagros Boutique Hotel. – Boat Cruise through the Southern Tip of the Baja to Santa Maria Beach. – Surf Lessons including surf boards. Airfare is not included. Go to www.kayak.com for best rate. Destination airport is San Jose Del Cabo – you will be picked up at airport. Rates are very good right now so “come on down”. We will stay in large cabin tents with beds in single rooms. Meals are nutritious and wholesome prepared with fresh produce from nearby farms. We watch the sun dip into the ocean at sunset and listen to the sounds of rural Baja.